Powerful and user-friendly as VLC is, chances are that some M4V format files in your video folder can't directly play using VLC. Different from the common video formats like MP4, MOV, AVI, FLV and WMV, you need to convert .M4V to the VLC supported formats. So today we are going to share the information about how you can play M4V files with VLC on your computer easily. M4V file is a video format developed by Apple Corporation to encode their TV series, music videos on the iTunes store. This format is completely same as MPEG-4 video format and even video codec except for FairPlay DRM copy protection which is provided added by Apple, causing people can't fail to play these videos with VLC media player. To play these M4V format video files you need an authorized computer with iTunes and the same Apple account you used to purchase the M4V video. 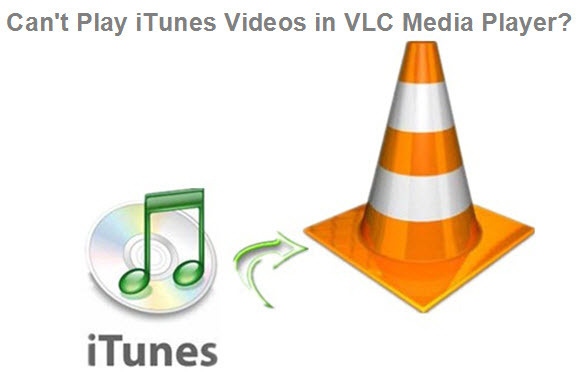 VLC media playersupports most popular audio and video formats except some. M4V format is just one of exceptions, it is the DRM protection on the video files making it not possible to be played directly in the VLC media player. Even users can’t play this format after buying from Apple iTunes store. If you are looking to play M4V file in the VLC media player then there is good news for you, you can easily play M4V video format in the VLC media player by converting the format to the VLC supported format first(skip to Part 5 to know about How to Convert M4V for Play in VLC Media Player), or download iTunes and sign in the Apple account you used to buy the videoon your Windows computer. 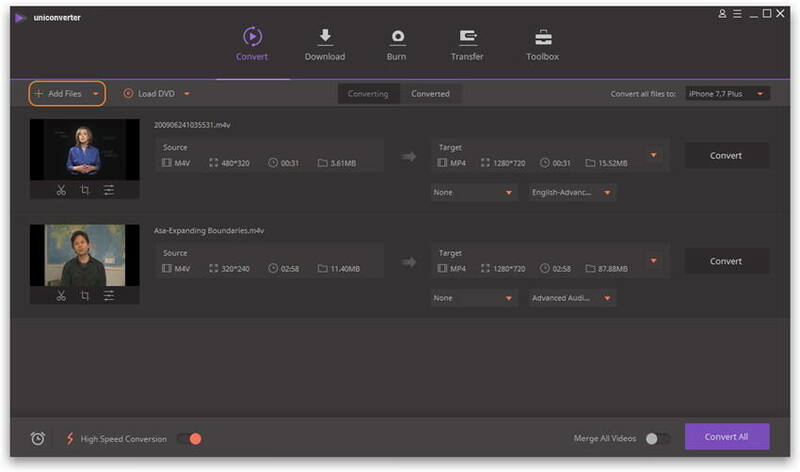 If you are considering playing the M4V files on your Mac via the VLC media player, then the corresponding solutions are just like what we provide for Windows users. You need to convert these files to other formats, such as from M4V to MP4 format, only then you'll be able to play M4V files in VLC media player on Mac. Another way is to sign in Apple account that you used to buy videos from iTunes store, then you can play these files on iTunes, but note that this doesn't play with VLC. 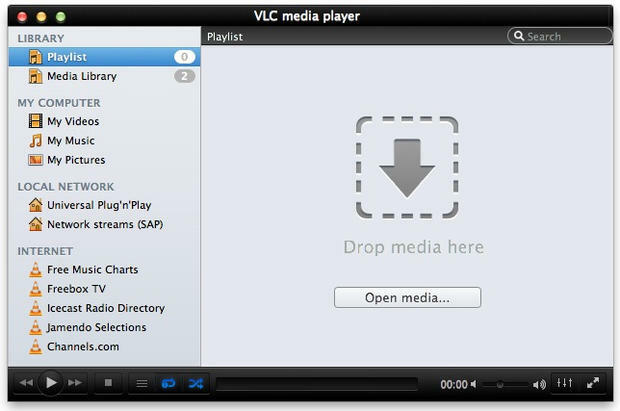 VLC media player is open source media player software which supports some video formats. This software supports MPEG (ES,PS,TS,PVA,MP3), AVI, ASF/WMV/WMA, MP4/MOV/3GP, OGG/OGM/Annodex, Matroska (MKV), WAV (including DTS) formats only. Namely, VLC can't play M4V files by default. What's more, the DRM copyright protection of M4V files from Apple can't be removed, so the only workable way is to convert .M4V to other compatible formats for VLC media player. 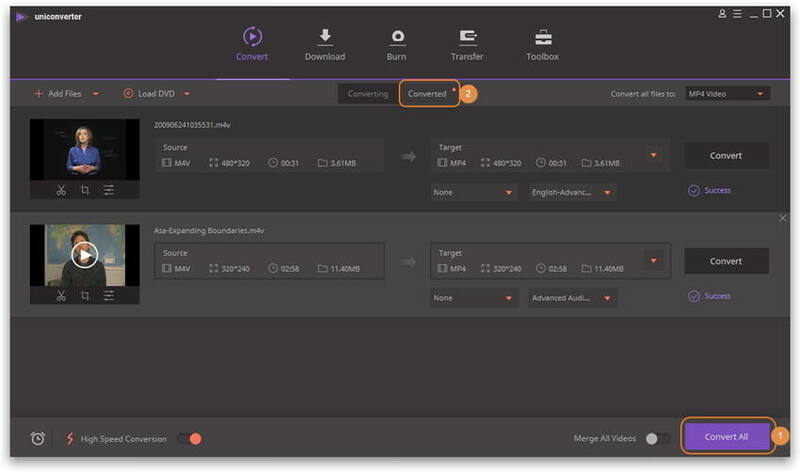 Wondershare UniConverter (originally Wondershare Video Converter Ultimate) is such a wonderful software and enables you to convert M4V for playing in VLC media player. It's so amazing that allows you to convert M4V videos to MP4 or other 150+ formats in a few clicks only. This software also acts as a video converter, DVD burner, downloader and video streamers. It is such a comprehensive video solution that you can't miss the following key features. Converts M4V file to other VLC supported formats so as to play .M4V in VLC media player. Download or record videos from video sharing sites, like YouTube, Dailymotion, Vimeo, etc. Step 1 First of all, install the program via the download button below and launch it. You can choose either Windows or Mac version. Step 2 Add M4V files. After launching program ,you'll under the Convert section > Converting tab by default. 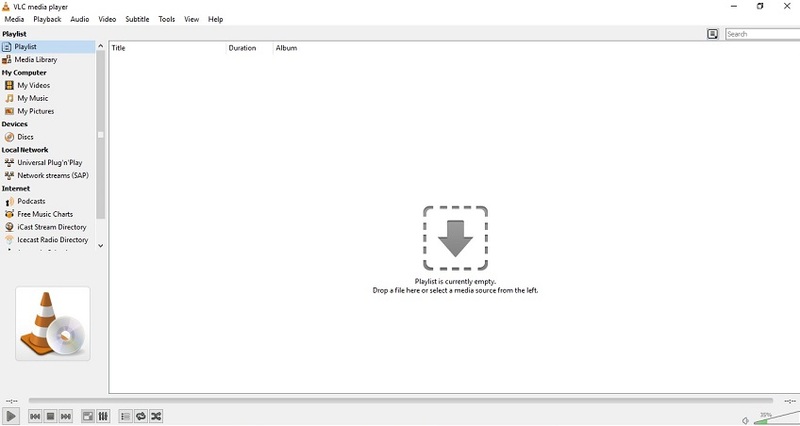 Add files here from your local computer either by drag and drop file or click on Add Files button on the interface. One pop-up window will open, you just need to select the M4V files you want to convert and click on Open button afterwards. Step 3 Select the output format. 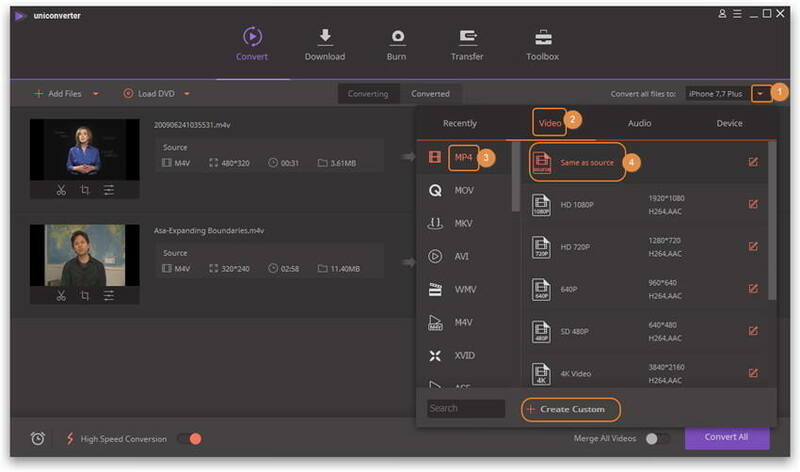 Once your M4V videos are added to the program, you can choose your desired video format by clicking the drop-down icon beside Convert all files to: and select Video> the video format like MP4 > the detailed preset. There are over 1000 formats available for your selection. Note: You can create your custom default output format as well by clicking on Create Custom button. Step 4 Convert M4V files to the target format. Finally click on Convert All button to start the conversion process. You can find this button in the bottom right corner. After the conversion completes, you can find the converted files in the Converted tab, right-click on the video and select the Open File Location option to find the output folder.